This Thanksgiving, the good old folks living at Pilgrim Place in the comfortable foothill community of Claremont, California, had much indeed to be grateful for; from their spacious grounds that are tucked safely inside the civic core of the tree-cloaked college town and the peaceful environs they enjoy to the fact that as Biblical-scale wildfires devoured vast swaths of the Golden State in what is now an annual inferno that this year literally choked out Sacramento, the gorgeous sweep of the Angeles National Forest that rises with Mount San Antonio behind their quaint foothill redoubt has remained mercifully un-ablaze, for now anyway. But as its 300-plus residents carved the bird and piled on the stuffing and passed the cranberry sauce and tried to save room for some pumpkin pie and cider along with much of the nation that still gathers around the table to consider the beautiful if deeply scarred wonderland that is America and to celebrate over bountiful plates her genesis as first captured in a celebratory feast in 1621 and all that we have to be thankful for as a result ever since, there is something else the good senior citizens at Pilgrim Place must also be appreciative of in the twilight of 2018. And that is the students at the Claremont Colleges, a nationally renowned cluster of small liberal arts schools that boast some of the largest endowments of private colleges in the nation (the 131-year-old centerpiece campus Pomona College has a $2 billion-plus savings account), haven’t yet seemed to notice that just a ten minute walk west from their own leafy archipelago that boasts all the comforts and indulgences that $300,000 for a four-year degree can buy rests a senior living community that dares to bear the collective name of America’s firsts colonialists. Or as it is viewed today through the so-called social justice lens: provocatively brandishing a nameplate that honors European mass-murderers. In this new Dark Age of Denouncement and the mandatory displays of virtue compliance and the associated public signaling it requires—symptoms of a strain of rabid progressivism that has infected the body politic and its cultural founts—the institution of Pilgrim Place, at least as it has been known for more than a century, in all probability is now living on borrowed time that is rapidly running out. While there are obviously no statues of Jefferson Davis, Robert E. Lee, Thomas Jonathan ‘Stonewall’ Jackson, James Ewell Brown ‘Jeb’ Stuart or James Longstreet anywhere on its grounds, no plaques dedicated to those who fell fighting valiantly for The Lost Cause, no statues of ‘Johnny Reb’ with his rifle in hand and elevated high above the lush landscape and defiantly facing east toward Washington D.C., just as there are no statues or memorials to John Caldwell Calhoun, Andrew Jackson, Davy Crockett or, God forbid, Strom Thurmond, the absence of such incendiary tributes can be little more than cold comfort to the peaceful inhabitants of Pilgrim Place. For this is now the era when mobs of jubilant students cloistered in their own ideological echo chambers, along with the street goon squads of self-deputized cultural Brown Shirts, whip themselves into a fever and then descend on historic relics to annihilate them in a frenzied glee as they chant the slogans that fuel their desire not so much for national rapprochement but rather a bloody reckoning they believe has come at last. Along with offending monuments and memorials around the country, businesses suspected of non-compliance or even providing insufficient support for the grand remaking of America have come under assault and, of course, the homes of individuals that have been denounced have also been targeted by menacing squads bent on sheer intimidation. So it only stands to reason that, well, to paraphrase an old saying: ‘First they came for the Confederate memorials, then they came for the Founders monuments, and then they came for the Colonial tributes. And then they came for…’ When they do come at least figuratively gunning for the pilgrims it’s likely that any visage of their existence outside of a museum exhibit or a classroom presentation that portrays them one-dimensionally as ‘America’s first racists’ that brought ‘white supremacy’ to the New World will be verboten. This progression of exultant nihilism that’s now harnessed for historical sandblastings may not have blossomed in Claremont far outside of its colleges just yet, but that train seems to be coming down the tracks. 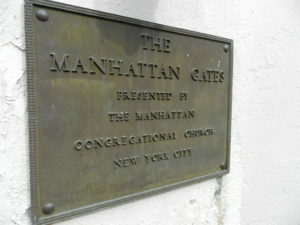 And when it finally arrives in front of the Manhattan Gates of Pilgrim Place, where Harrison Avenue meets Mayflower Road, it’s hard to imagine just how an overwhelmingly white senior living community that is named for the first colonialists who arrived nearly 400 years ago can escape being damned in a hysterical rage as nothing more than another vile tribute to and hallmark of the genocidal slaughter of the indigenous peoples of North America. Whenever that happens, it will be yet another case of the progressive Left’s progeny devouring their own elders in a euphoric state of cannibalistic entitlement. If that sounds like hyperbole (at least to anyone who hasn’t been paying attention to what has been happening on the nation’s college campuses over the past generation that has hit warp-speed since November 2016), consider that but a few years ago a student at the Claremont Colleges who was also a staff member of its radio station KSPC 88.7 fm—which remains an indisputable free-form gemstone of the airwaves that has long shone brightly among the constellation of college radio stations in the United States—penned an Op-Ed piece for the five-college campus newspaper The Student Life that declared the sweeping lawns that are an integral part of the colleges historic aesthetic, as well as so much else of Claremont, was actually an act of colonial subjugation of the indigenous peoples of Southern California. Not the Hotel California, but not that far away either. Fine lawns and tousled palms. 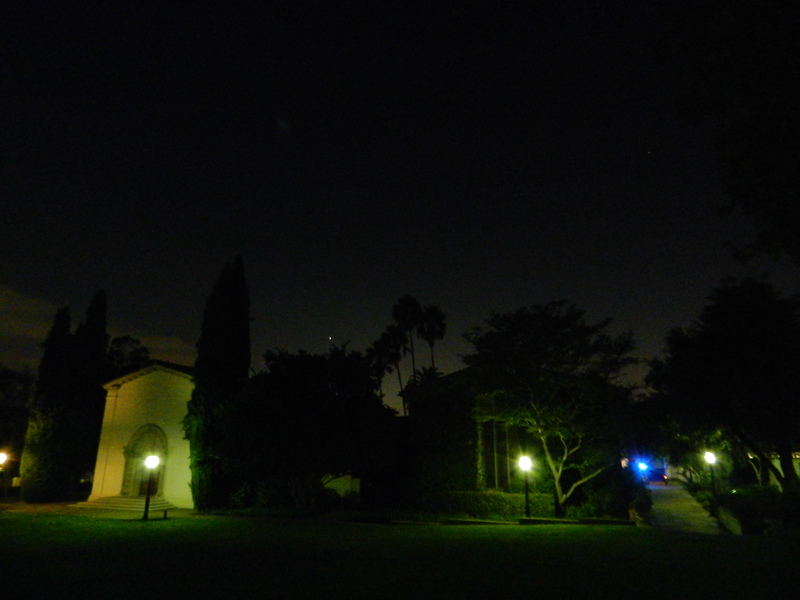 Scripps College after dusk. 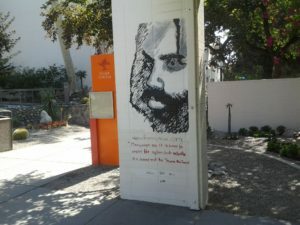 But his argument and the sentiment that gave birth to it is not an outlier on campus today, to the contrary it is the common coin of the ideological currency that passes between a radicalized faculty and the students that they groom to their own sociopolitical agenda and it funds ever more extravagant claims of moral superiority, self-righteous indignation and the self-anointed right to issue regulatory diktats to the surrounding community and society-at-large regarding everything from monuments to mass media to masculinity. So by its very name alone Pilgrim Place is surely destined to make the social justice jihadists’ movement’s ‘to-do’ list, sooner or later—but probably sooner. That its inhabitants are as white as the colonials that first stepped off the Mayflower and that its grounds reflect a decidedly comfortable Anglo aesthetic will make it only that much more sweet of a treat for that virulent strain of progressives who find ‘old white people’ simply reprehensible at face value. Tai chi, anyone? 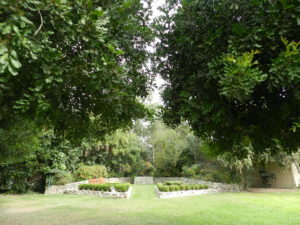 The exercise garden at Pilgrim Place. There is, of course, rich irony to be found in the looming fate of Pilgrim Place as it now exists, but one that might not be immediately apparent to those who don’t understand the sociopolitical genetics of Claremont, a quiet foothill town of 36,000 that’s nestled in the Pomona Valley on the far northeastern edge of Los Angeles County and one that remains an oasis amid a teeming Southern California that’s in the midst of the disintegration that precedes its utter collapse. Priding itself as the ‘City of Trees and PhDs,’ Claremont consistently makes national magazines ‘Best Places To Live,” ranking fifth in Money’s national Top 10 a decade ago. But Claremont has also managed to do something amazing throughout the past half-century, a feat that most other towns and cities throughout the ever-churning sprawl of Southern California have been mostly unable to replicate: preserve its civic identity. Glendora, that ‘Pride of the Foothills’ might come close, perhaps with her sister Monrovia, and fabled Pasadena in some respects has also preserved glimpses of its past, but even the Old Money and their tastes that once defined the City of Roses that falls 24 miles west of Claremont couldn’t stop most of the makeover that has generationally swept the region. Yet in Claremont, time has stood still. Well, almost. Perhaps no one event reflects this quite as much as the Fourth of July in Claremont, which in 2018 was as much as it was in 1968; a city festooned with flags and bunting cavorting along with the face-painted festivities in Memorial Park and a parade down Indian Hill Boulevard for which most of the town turns out before falling back into front yard and patio parties and driveway soirees as locals who have known each other for decades drift from one shindig to another before half the town is on the march again into the college campuses with lawn chairs, blankets and ice chests in tow as well as clambering atop various rooftops to watch city’s firework show. Then it’s back to the after-parties. And rare is the moment during this observance of the national holiday when a real casualty beyond the customary DUI or two occurs. From its character to its complexion, Claremont has remained relatively as it was a half-century or more ago, a bohemian-flavored Mayberry of sorts that still offers a quaint downtown village with a Main Street, USA, feel that’s dotted with eclectic small shops that appeal to the craft-styled sensibilities of the old-school organic hippies that remain in town and yet with enough upscale flair to capture and indulge today’s moneyed progressives that increasingly demand couch-lined, crystal-filled fire pits and appropriate mixology poured into something shiny in order to properly discourse on social justice and its hierarchal pecking order of laity(sheep), warriors, jihadists, the high clergy and the prophets. There are still some real liberals ambling around in Claremont, old heads of the Captain Trips variety still intent on living a laidback lifestyle while holding to the old hippie credos of ‘do your own thing’ and ‘live and let live.’ The kind of liberal (this writer included) that still not only enjoy but actually relish finding themselves at tables where the voices don’t sing in choral unison but rather play swinging jazz; friendly and passionate sociopolitical discourse in free-form. Yet some things are changing around town. The plethora of groovy little shops has diminished over the years, as defining classics like Rainbow Rags and Raku that peddled those most needful things to the offbeat connoisseur and independent booksellers like Chancery Lane and Second Story Books that enticed readers of the printed word and even real world coffee joints like Three Cs and Nick’s Cafe disappeared under the long tide of rising rents and the nouveau riche that ride it in, preferring the sanitized sameness of a Santa Monica-esque salon or concessions that cater to the cable-fed palate of the Real Housewives of Claremont. But enough of the OG (Old Guard) joints persevere around the village to act as bulwarks of character and just enough of the more recent arrivals have a sense of history and place to maintain a going concern of what has long been the best of this small town. This slice of Wonder Bread Americana sits just north of Pomona, the former citrus powerhouse that a century ago was the cultural and economic capital of the surrounding valley that still bears its name. But Pomona was fated to share the destiny of so much of the rest of the region and the city of 160,000-plus people was eventually swallowed whole by the chaotic and often violent dysfunction that became the hallmarks of Southern California’s transformation. By the late 1980s, the Pomona Police Department’s aero bureau was grounding its helicopters on the Fourth of July and New Year’s Eve due to the fusillades of gunfire that would erupt from backyards, alleys and even the avenues into the night sky, a ground show that continues today throughout Pomona annually as the booyah roar of shotguns are accompanied by the staccato ‘pop, pop, pop, pop, pop,’ of semiautomatic weapons fire and even the occasional burp of full-auto assault rifles. 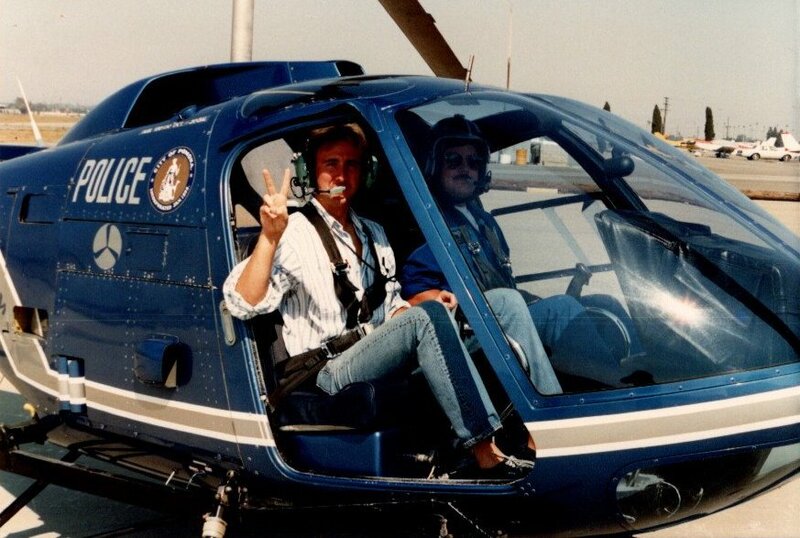 The author, an old reporter who cut his journalistic chops on the crime beat in Los Angeles County, about to go up with Pomona PD’s aero bureau from Brackett Field, circa late 1980s, when the soup was getting thick down in old P-Towne below. 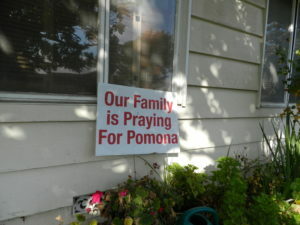 By this time Pomona PD’s choppers were grounded on the Fourth of July and on New Year’s Eve as a result of the gunfire. Meanwhile, the hacky sack tournaments continued apace in Claremont. Aside from the Beirut-lite like nights that can suddenly flash like paparazzi on the red carpet in old P-Towne, the everyday differences between Claremont and Pomona are immediately evident as one drives Pomona’s cratered and crumbling streets that are lined with an enormous amount of cars even throughout its residential neighborhoods, with many single-family homes harboring six or seven vehicles. The residential dwellings outside of Pomona’s historic downtown core, often two and three bedroom dwellings typical of the Eisenhower and Kennedy era and the Cold War housing boom fueled by long-gone defense industry jobs, are now not home to a proverbial nuclear family but rather two or three families with the garage converted into makeshift living quarters to better accommodate the double-digit number of inhabitants. Add to this the potpourri that inevitably accompanies such intensifications of human population densities—shopping carts that spackle dead front yards and sidewalks as something akin to repurposed utility vehicles and/or multi-toddler strollers, loose dogs of every genus but often the always friendly pit bull and sweeps of litter that are dotted with empty Budweiser cans and the detritus of used diapers—and the darkly comic reality of Pomona’s official motto: “Vibrant, Safe, Beautiful” is impossible to deny. 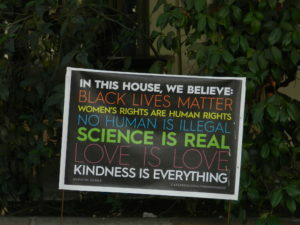 Unless, of course, you live in Claremont. In which case the San Bernardino Freeway (I-10) running between most of Pomona and Claremont has long stood as something like the Rio Grande or the Great Wall of China, a demarcation of sorts that provides a comfortable enough of a barrier or blind to allow many white liberals in Claremont a cozy cocoon in which to hold court during their breezy evening salons where they discuss the joys of their radical social engineering projects safely away from the roiling reality of their field tests; the rattle of their cocktail shakers a sweet bossa nova that offers a soundtrack to their perpetual buzz of being immune to uncomfortable facts and impervious to social policy failures. And it is in this womb that remains resoundingly Anglo—in a state where the Census Bureau designated ‘non-Hispanic white’ population as a whole has dropped to under 37-percent—where Pilgrim Place finds itself still safely in utero today. 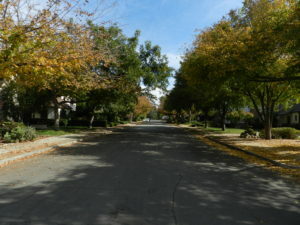 Among people of good conscience and at least somewhat decent character, the racial and ethnic complexion of Claremont as a whole and of Pilgrim Place in particular should rank somewhere between irrelevant to innocuous, just as it should for preponderantly black, Latino and Asian communities and their senior citizen centers across Southern California, the nation and the planet. How did Depeche Mode put it? People are people. 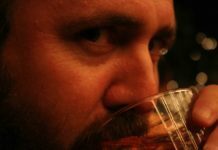 But for the woke white progressive today—for whom now everyday is a faux struggle with The Unbearable Whiteness of Being (apologies to Milan Kundera)—such a concentration of whiteness is beyond problematic, it’s viewed as symptomatic of an affliction, an infection, like an elevated white cell count. It is viewed as something that can’t be left untreated. In the progressive lexicon of [fill in the blank] ‘justice’ causes, like a Time-Life CD collection, all the hits are here! 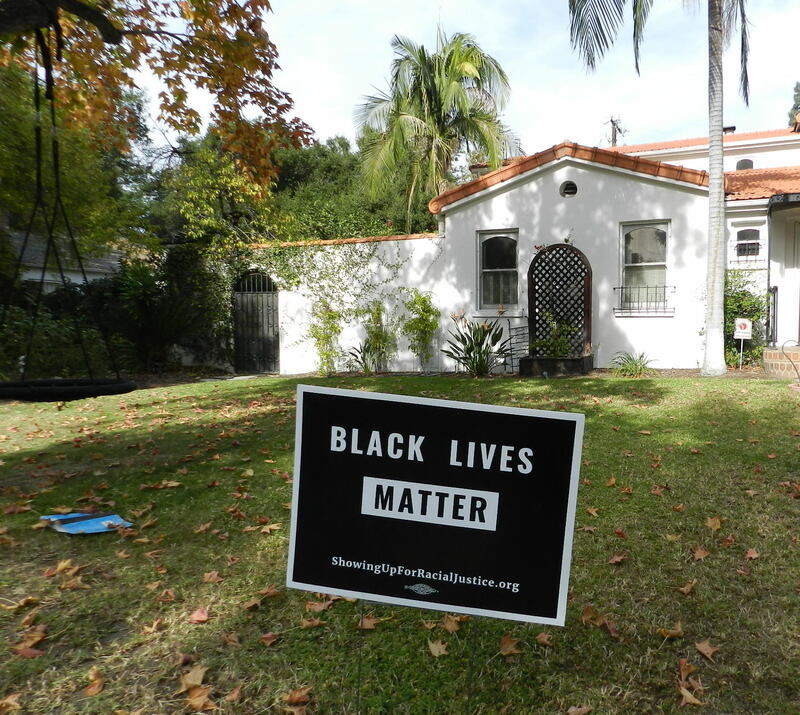 On the frontline of the struggle for racial justice in Claremont. Aperitifs served at 4 p.m. promptly, invitation only, of course. We’re so glad you’re our neighbor…especially since you own the $1.2 million homes on either side of us and we know exactly who you are. Whew! 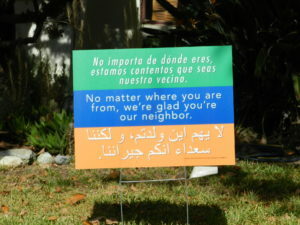 Welcome immigrants and refugees! However, please read the warning signs about parking or you will be towed. Also, American homeless people showing up around our donated clothes drop-box, we’ve discontinued that since you kept hanging out. Please go away. As nearly omnipresent as these virtue signals are around Pilgrim Place—and they manifest inside of it as well—they are small beers when considered against the full pitcher pours of sanctioned political messaging on display in the Claremont Colleges, where the town’s yard signage is dwarfed by murals of Che Guevara, convicted cop-killer Mumia Abu-Jamal (real, less revolutionary name: Wesley Cook) and the street-thug-turned-progressive-martyr Michael Brown. 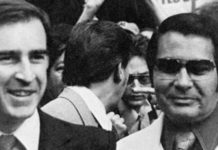 While Guevara’s revolutionary bona fides are the stuff of legitimate legend, no matter how one feels about his political philosophy or the fact that his image has been hijacked and pimped out in an obscene commercial defilement of what he fought for, Brown’s credentials rest simply in the fact that he was a black man shot and killed by a white cop, post-mortem media makeovers that transformed him instantaneously into a child-scholar executed for being black aside. 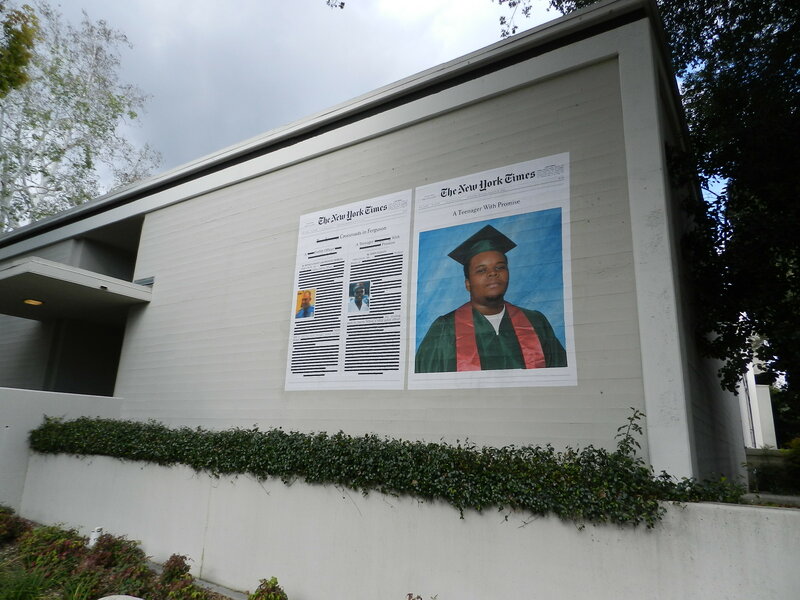 At the Claremont Colleges, if you’re killed by a white cop, you are venerated. But if you execute a white cop on the street, well, you’re also venerated. So, you know, it all balances out. Here’s the campuses tribute to cop-killer Wesley Cook, rebranded by the media as Mumia Abu-Jamal. He managed to escape execution, but not evisceration by Howard Stern’s old terrestrial radio show, which put this miscarriage of justice back on the map at least for awhile. That Attorney General Eric Holder’s investigators determined the baseline narrative of ‘hand’s up, don’t shoot’ was pure fiction baked into a Maoist-like slogan matters not in the slightest, of course, and thus people traveling up and down College Avenue in Claremont today are treated to the large visage of a Michael Brown in cap and gown in an artistic imagination of a front page article in The New York Times. Next to it, evidently for context lest someone dare to not know the required political truism let alone doubt it, is an equally large and imagined front page from the Old Gray Lady that depicts Ferguson Police Officer Darren Wilson depicted as ‘A Profile Officer’ — i.e. an officer who racially profiles, i.e. a white officer that was hunting that fateful day for a black kid to kill, i.e. another storm trooper in Trump’s Amerikkka. Well, at least $300k for a degree apparently buys certitude along with it. Post Mortem Makeover: Michael Brown ascends to martyrdom in a college town where most people would call the cops if he was smoking that Swisher Sweet in front of their homes. Perhaps truth is the first casualty in art. After all, it doesn’t take long on the very same walk around the very same neighborhood to notice some very clear counter-messaging to the programming narrative. 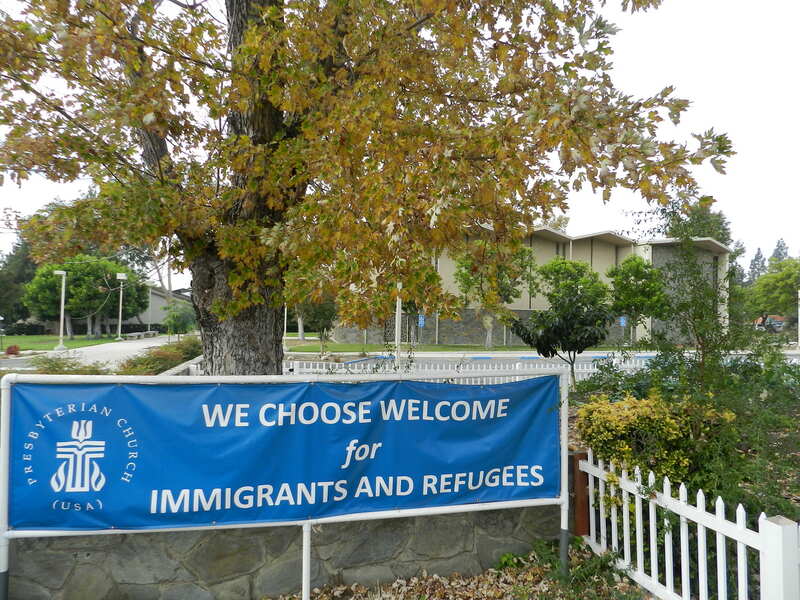 Claremont Presbyterian’s declaration that they choose to “welcome immigrants and refugees” also makes damn sure that every driver pulling their car onto church grounds understands that “unauthorized vehicles” will be towed. The church also once offered a drop-box for goods to be given to the homeless—but that was removed after the homeless started arriving at the church to collect directly. 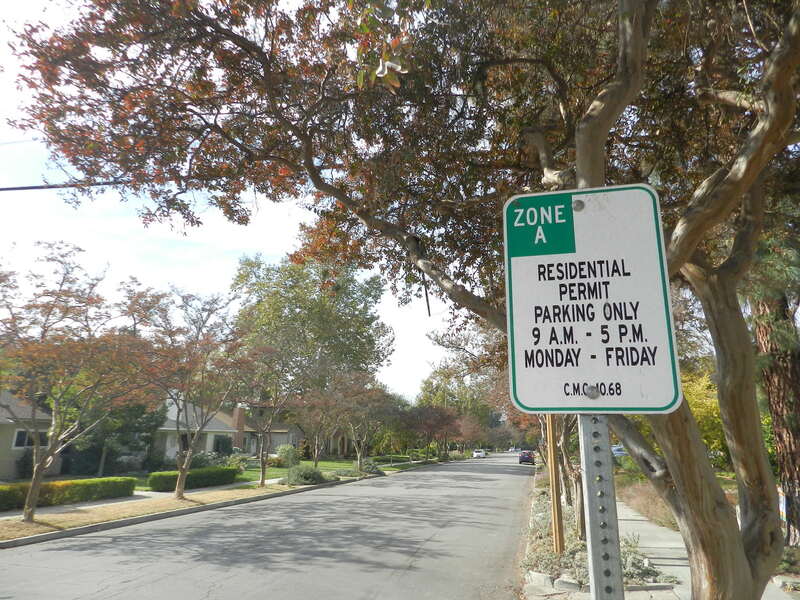 A little further north, along residential streets sporting signs of progressive ‘Welcome!’ in the front yards are signs anchored in concrete along the sidewalk that declare the streets to be permit parking only. Violators will be towed. Other signs warn against off-leash dogs. Indeed, signs at every entry point across the city advise that overnight parking is forbidden. 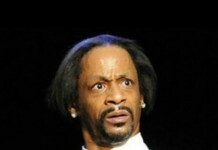 But anyway…Welcome! Claremont chooses Welcome! But permit required. Even in Pilgrim Place proper, there are plenty of signs offering cautionary advisements to all who pass its gates as to what is not, in fact, welcome: solicitors, rollerblades, roller skates, skateboards, unleashed pets and, oh, naturally Pilgrim Place is “Security patrolled for your protection…Enjoy your visit.” Boom, there it is. 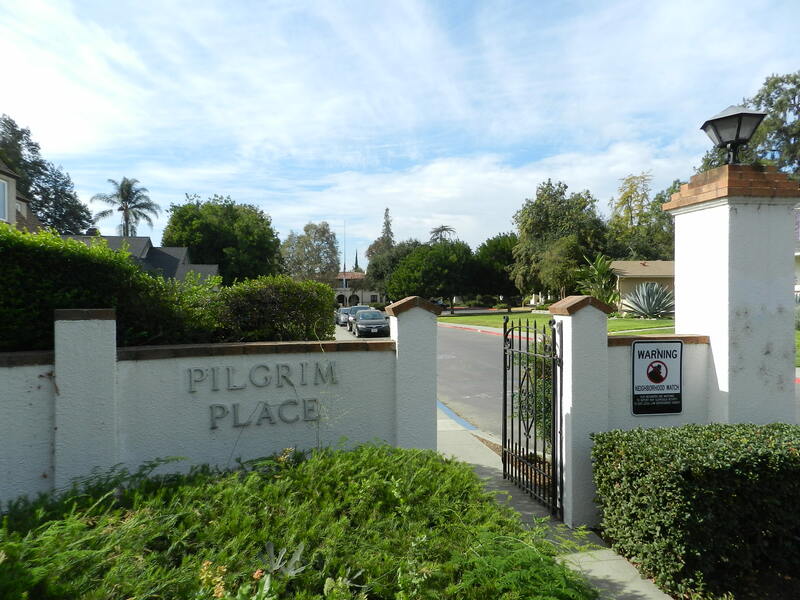 And despite the December to May age spread, there are notable similarities that connect Pilgrim Place to the Claremont Colleges, aside from the obvious state of privilege and those sweeping lawns of greenery. Both campuses are in fact security patrolled, lest the proverbial welcome mat become over-used by less than desirable elements, though Pilgrim Place doesn’t appear to have descended into the London-like Big Brother state that is forested with closed-circuit cameras, which is now a hallmark of the Claremont Colleges. And both are always welcoming new residents with the mere caveat, of course, that they can afford to be there. In 2018, a one person ‘entrance fee’ at Pilgrim Place cost a hopeful senior a non-refundable $258,240 just to make it past the gates, then another $3,232 per month for a 1,200-square-foot unit to bide their time in until the grave calls, Tai chi garden inclusive. So in an a way, Pilgrim Place could be considered the tail end of the life that most of the Claremont College students begin, sort of a cradle to grave arc. Of course, the reality is that it is Claremont’s fastidious commitment to the foundations that underpin its collective quality of life—something akin to former NYPD and LAPD honcho Bill Bratton’s ‘broken window’ policy—keeping its streets clear of vast fleets of cars overnight and enforcing health and occupancy codes, that actually put this small little nook of old Leftyland consistently atop the ‘Best Places to Live’ charts. As for the Mr. Rogers-meets-Arianna Huffington pap of ‘We’re glad you’re our neighbor’ and ‘Showing up for racial justice’ that’s peddled in front of seven-figure real estate, well it’s a fine sentiment advertised by white elites who already know who their neighbor is. The rubber would meet the road the moment three families totaling thirteen or more men, women and children moved into the house next door that was built to accommodate four and brought five cars with them (in working order or not) and then converted the garage into a bunk house and let the roosters loose to roam in the backyard and wake the neighborhood cheerfully each morning. The moment that happened, the ‘We’re so happy you’re our neighbor’ crowd (which is a direct descendent of the ‘One of my best friends is black’ white dinner party crowd a generation ago) would be blowing up City Hall’s hotline demanding that code enforcement officers raid the place with all the panache of ICE agents descending on the parking lot of a Home Depot. 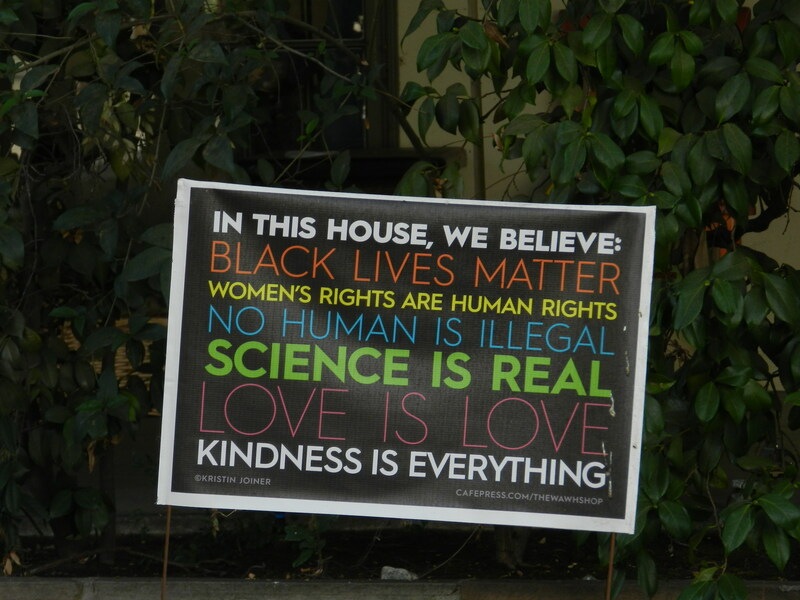 In this house we believe in all of the below, unless of course your name is Sarah Palin, in which case lines three, four, six and seven do not apply. If the financial barriers that keep them safely removed from the hard-edged reality of places where their slogans are even more meaningless than they are on the streets of Claremont were to someday fail, and if the city’s code enforcement was unable to quash the threats to the quality of their life, then these same people proudly proclaiming that they are showing up for ‘racial justice’ and insisting that ‘no human is illegal’ would do what they have always done in America. So for all the signage, for all the public proclamations, for all of the sociopolitical sanctity that shines from the crepe myrtle, sweetgum, coastal oak, jacaranda, eucalyptus and sycamore lined streets of Claremont these days, well, one can get the feeling that it’s not so much a foundation anymore as it is a cover. Billy Shakespeare’s line about protesting a tad too much comes to mind. A typical street in Claremont, California, mid-afternoon in 2018. As the state collapses, you wouldn’t know it so much from here on most days. And perhaps that’s what the good folks at Pilgrim Place are hoping for, maybe even praying for now, amid the pleasantly hushed lanes of Mayflower, Plymouth, Leyden, Scrooby, Alden and Avery that have sheltered them from the fine young cannibals that have not so much seized the academy as they have been turned loose by it. Perhaps they are praying they go unnoticed in this most socially dangerous hour. Just as the San Bernardino Freeway acts as something of an illusory Forbidden Zone barrier to the south, Indian Hill Boulevard is a two-lane blacktop in the heart of Claremont that may as well be the Danube for the amount of students that manage to cross it. Claremont’s pilgrims can be thankful that most students orbit outside the camp, er, campus, ends at either The Press, a genuinely legit bar and live music venue, or Rhino Records, its vinyl repository of note. Some do indeed manage to cross Indian Hill, but usually further south in the shallows where they make their way into The Whisper House or Eureka! Maybe Pilgrim Place is hiding in plain sight and hoping the campus compliance squads simply will continue not to notice there is a senior sanctuary named after, and indeed represents in every respect, what they’ve believe to be horrifying heirlooms of hate. Three miles and a world away from Claremont, the reality of the progressives’ field experiment has led to this desperate act that is planted all over Pomona. When all hope is gone, apparently there is nothing left to do but pray. Because in California anymore, voting sure isn’t gonna cut it. 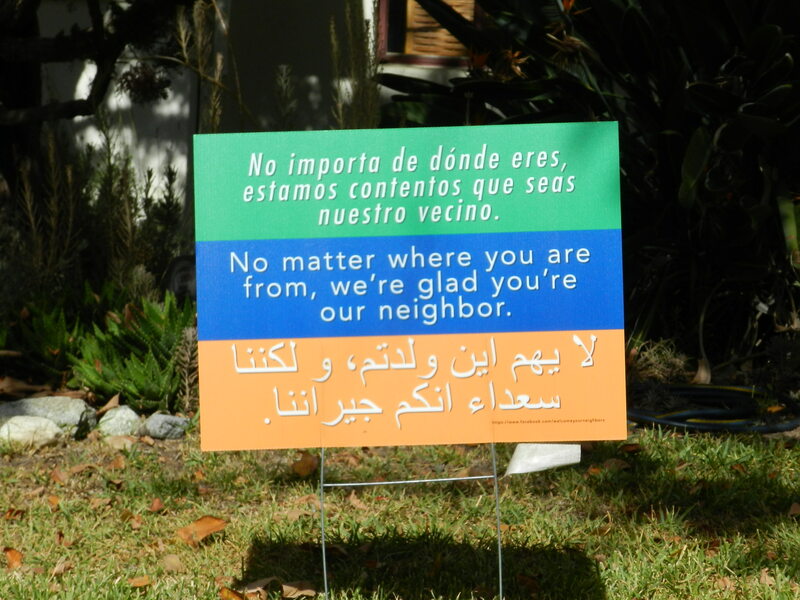 For all the talk of ‘Welcome’ in its sister city to the north, it’s not clear that sign—like the people that plant it—would be welcome at all in Claremont these days, what with the ‘praying’ and all. So good luck, pilgrims, you’ve always seemed like kind, decent and thoughtful people doing nothing more than trying to live out your twilight days in peace. Sadly, that’s probably not going to count for much when what’s coming finally arrives on your doorstep.